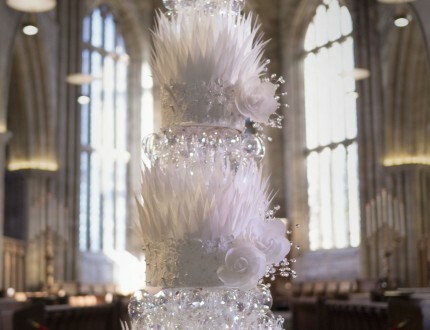 All you fans of the Crystal Palace Cake are in for a real treat! In this lesson, Paul whets our appetite by taking us through the design, basic structure and how he’s going to put it all together. We’re a little excited too! BEFORE YOU START: note that the baubles are glass and not gelatin which you’ll need to source locally. PUTTING BAUBLES TOGETHER: For guidance on how to put the baubles together go to the Extra Lesson (15). Look at the size of that bottom cake! If you’re wondering how you’re going to neatly ice something that size, don’t worry – Paul shows us how to do this step-by-step and as he does so, he takes us through more of the theory behind the design. If you have watched the Crystal Palace Cake tutorial, then you may well know what you are doing but Paul gives us a refresher just in case. 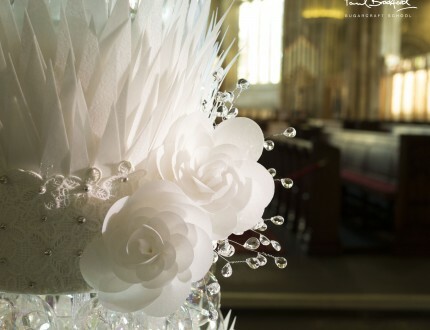 If this is new to you, you will be amazed what varied results you can achieve with wafer paper! Paul shows us how he cuts it up and adds it to the cake in a uniform and eye-catching way. This process is time consuming, but well worth it! 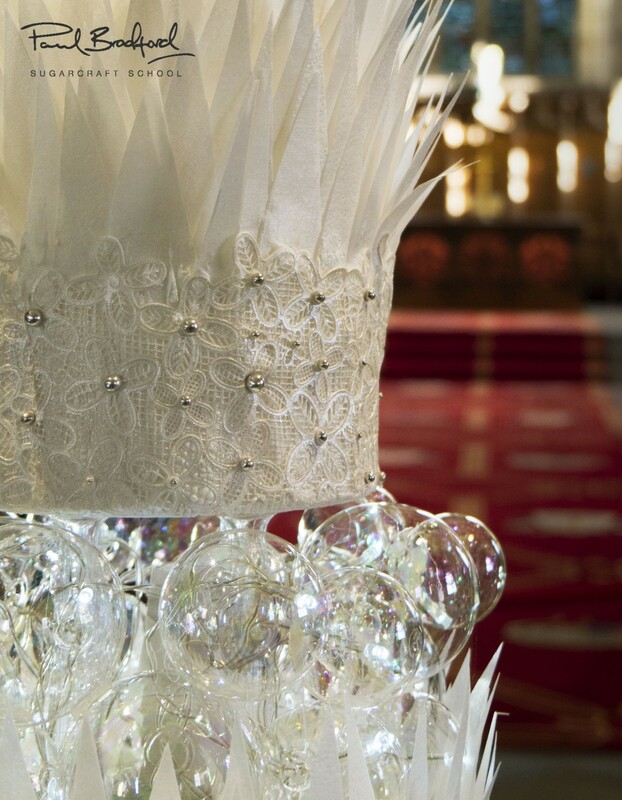 In this lesson, Paul shows us how to prepare the Cake Lace that is really going to add to the wow factor of this cake and gives us a couple of tips along the way for producing strong lace that holds well. This is where things really start to take shape. 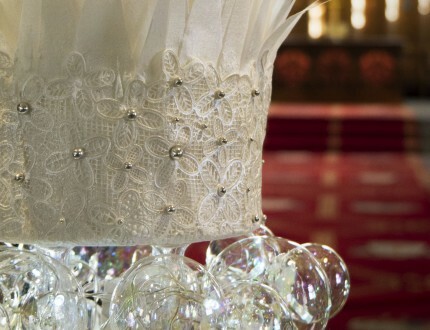 Adding the lace gives the cake such a lovely touch. In this lesson, you will see this for yourself! Time to add some bling! 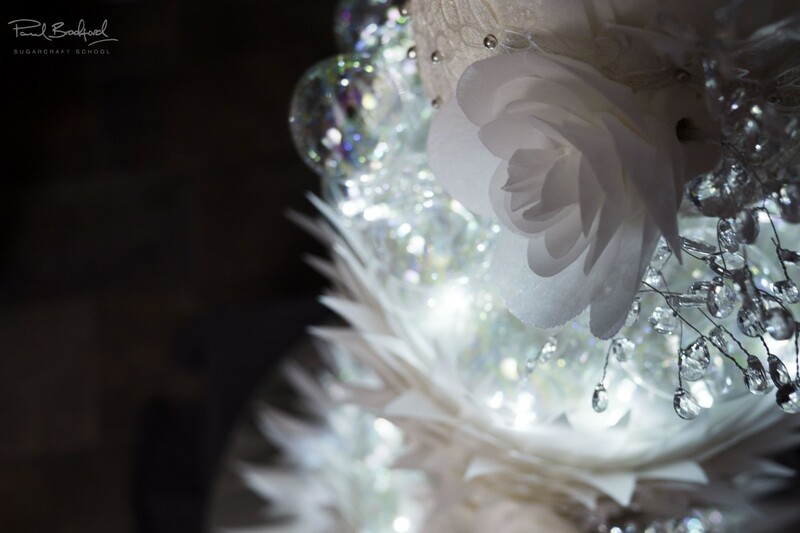 We all love a bit of bling but of course it has has to be added in a tasteful and classy way. This part can get a bit fiddly and we recommend that you get yourself comfortable as this is quite a lengthy process, but again a very rewarding one. In this lesson, Paul shows us a beautiful and simple way to make flowers using wafer paper, a little bit of sugarpaste and a drop of gel. He starts by demonstrating how to make the first set of petals and the basic structure to hold the flower together. By the end of this tutorial, we guarantee that you will be very excited and full of ideas about the various ways you can use wafer flowers for your cake decorating! 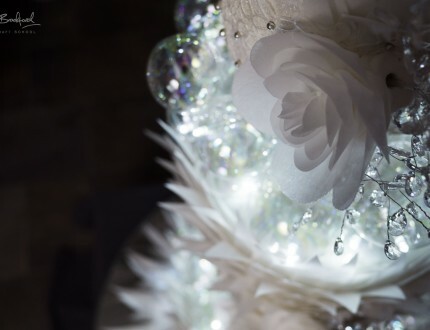 They all come to life and seem especially spectacular when they’re surrounded by the lit up glass baubles. If you would like to see how the glass baubles stands are made, you can find out by watching the Supporting Lesson at the foot of the page. Now it’s time to start assembling this beast of a cake! If you need a hand putting the stand together check out our Supporting Lesson at the foot of the page or by clicking here. In this lesson, Paul shows us how to add support to the bottom cake and maintain a strong structure as this will be a very heavy cake. You will see that he comes up against a couple of issues along the way as one might expect, but don’t worry – Paul’s quick thinking saves the day! In this lesson, you will be forewarned about how to deal with certain issues you may come across when you are adding the lights. Paul shows us another simple but beautiful way to decorate the base of the cake, once again making use of wafer paper. Who would have thought it had so many uses? Let’s see how he does it. We’re sure that you must be as excited as we are about how this is all coming together! This is the truly magical part and by the end of this lesson, you will really start to see the cake coming together. Paul shows us how to discreetly attach the lights so that they don’t take away from the elegance of the cake. It’s time to build this cake! 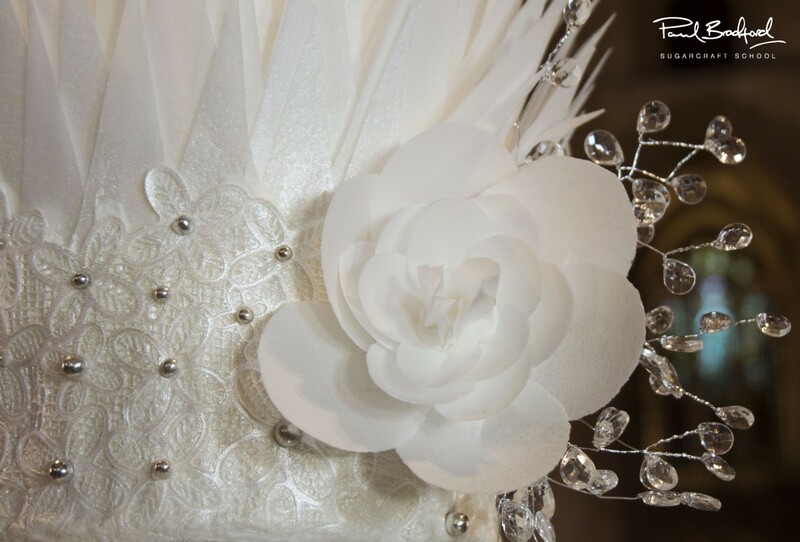 In this lesson Paul finishes assembling the cake and adds the beautiful wafer paper flowers. You’ll learn not only how to do add these on securely, but also get an idea of how to arrange them on the cake in a way that flows well and pleases the eye. 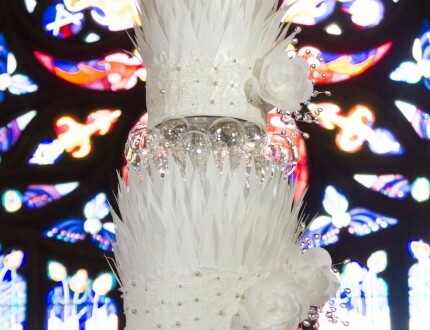 It’s time to finish off this impressive cake by adding some delicate and tasteful bling. 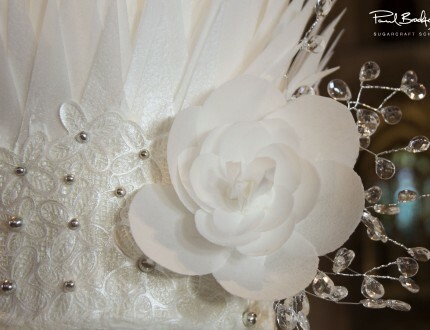 Let’s see what Paul is using and how he arranges it so that it adds a bit of sparkle. This is another stage where you might have your own ideas – have fun and get creative! You may have already seen this Lesson on Paul’s original Crystal Palace cake, but here’s a quick reminder. 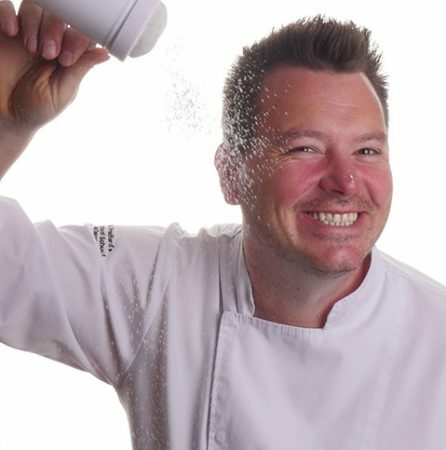 In this section, Paul gives us some other ideas we can use to put our touch on the cake making it that little bit unique. The suggestions are quick, simple and tasteful and we’re sure you will have some of your own ideas too. It’s what we’ve all been thinking…How much does this cake cost to make? 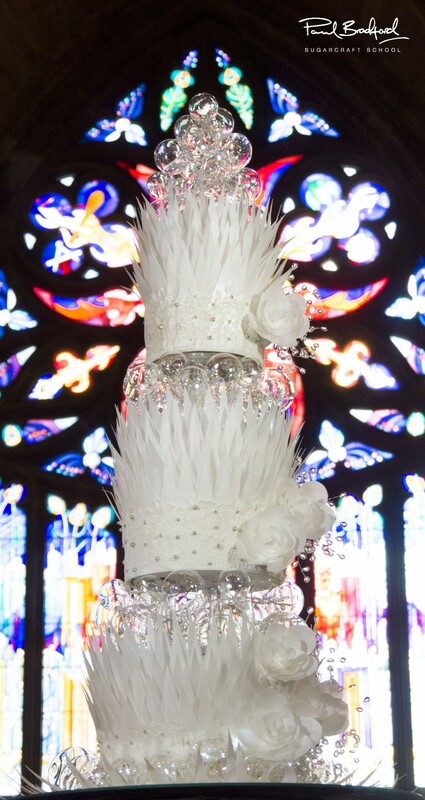 Paul's truly impressive Crystal Wedding Cake will make an incredible centrepiece for a modern wedding or major celebration. 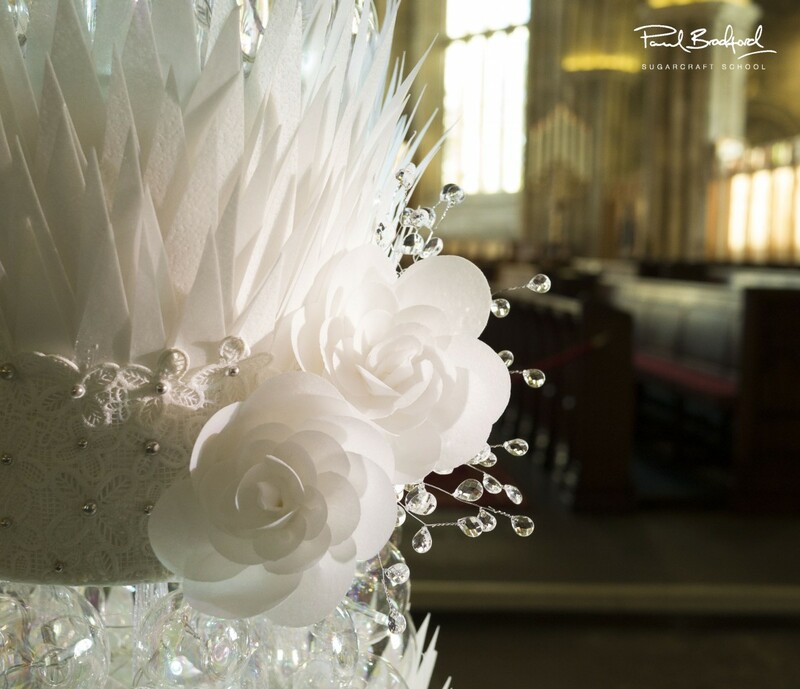 The design is based on Paul's popular Crystal Palace Cake, with even more lovely details incorporating delicate cake lace and wafer paper flowers. This course is suitable for intermediate to advance level and requires one full day to create. 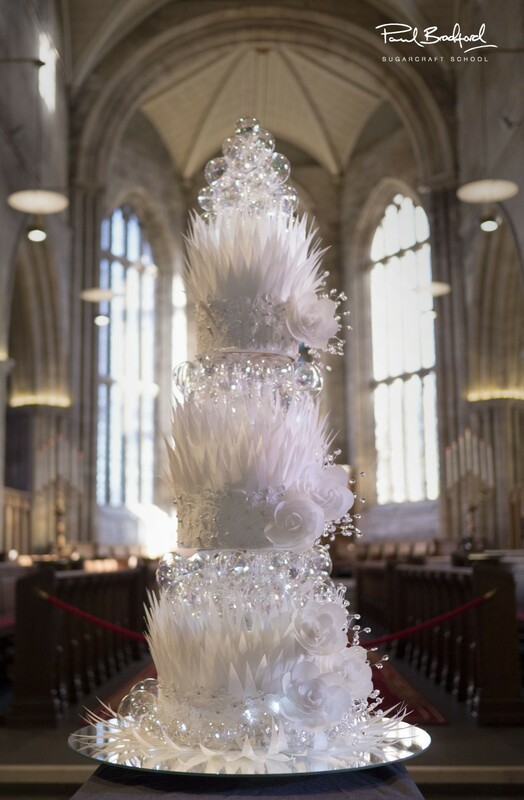 We would love to see your take on the Crystal Wedding Cake – please share your photos with us on our Facebook Page!